Camden Dunwoody’s one, two and three bedroom apartments, conveniently located at Atlanta’s perimeter in peaceful Dunwoody, is the perfect solution to your commuting problems. Our renovated apartments are just minutes from all of your shopping and eating desires at the Perimeter Mall and a short 15-minute drive to the heart of the city. Enjoy the convenience of being close to everything, without the hassle of city traffic. Each Dunwoody apartment home features unique layouts with upgraded interiors with stainless steel appliances, granite counter tops, custom cabinetry and LED track lighting. After cooking your meal in our beautiful kitchen end your long day with a bath in our oversized soaking tubs. Don’t forget to stock our built in bookcases with all your favorite books! Take your home outdoors by relaxing by our saltwater pool while you wait for your food to cook on one of our three gas grills. Want to get in shape instead? Take in a yoga class in our yoga studio or work on your fitness in our fully equipped 24-hour fitness center. Bring your furry friend with you, or add to your family so you can utilize the expansive dog park at Brook Run Park less than a mile from our community. Make sure to give us your pet’s cutest photo and they might be selected as our Pet of the Month and receive a special treat! Camden Dunwoody is waiting to make your life easier. See you soon! 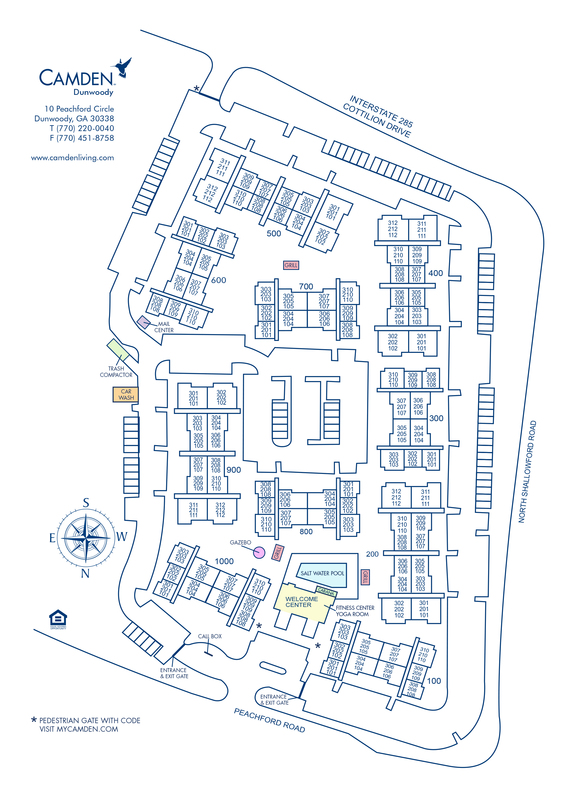 Resident and visitor parking is available on a first-come, first-served basis. Detached garages are available for $75 per month.